Description of mobile torrefaction program at NCSU. 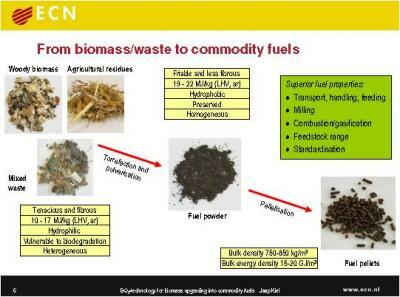 Development of 2nd Generation Pellet fuels in the Netherlands: Torrified Pellets Pell@tlas, European Pellet Centre, Newsletter, January 2008. A major technical obstacle in entrained-flow gasification of biomass concerns the size reduction and the subsequent pneumatic transport of the biomass powder. The fibrous structure of fresh biomass makes it very difficult and costly to reduce its particle size down to below 500 microns.